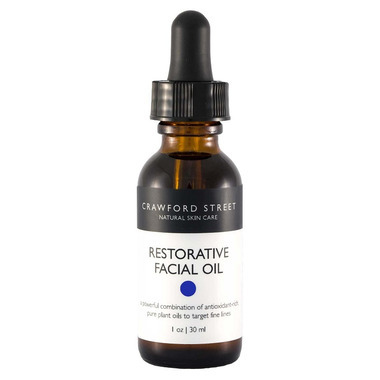 Crawford Street Restorative Facial Oil is high in Vitamin E, antioxidants and essential fatty acids. This is an excellent choice for those with dry/mature skins as the combination of avocado, jojoba, and rosehip help to revitalize and rejuvenate the skin. Directions: Apply under moisturizer, or on it’s own, after cleansing. Massage a few drops into face and neck with finger tips, using upward strokes. Avoid eye area. This is my second bottle. I love the scent and it does wonders for my skin. I absolutely love this product. I like the smell and the consistency. Absorbs nicely. I have extremely dry skin with eczema, since I've started using this I've noticed minimal dryness. I use this first thing in the morning and at night and it doesn't make me breakout. Definitely worth trying if you have dry skin. Another stellar product from Crawford Street! This has replaced my long-time go to face oil by Pai, which says *a lot. * Nice scent and not too liquidy. I am already seeing a difference in my skin after few days of use.